Optin Contacts is the industry leader in providing the most accurate and verified Dell Server Users Email List to help enhance your marketing campaigns. Reach out to the global community of Dell Server Users with your marketing message and open up new avenues for acquiring new clients and prospects. The Optin Contacts Dell Server Customers List includes many fields of information such as First Name, Last Name, Title, Email Address, Company, Address, City, State/Province, ZIP/Postal Code, ZIP4, Country, Phone, Fax, Employees, Sales, SIC Code, Primary Industry, NAICS and Web Address. Dell Server Users Email List by Optin Contacts represents businesses and their executives who hold the decision making authority in Dell Server using companies. You can use this extensive database for consulting purposes, services and other upgrades. All our data is acquired through in-depth research that is regularly updated and cleansed to maintain accuracy and eliminate any chances of data duplication. Dell is considered to be among the leaders of IT hardware vendors in all industry segments in which it competes, chiefly servers, storage, PCs and services. Dell is considered to be the “youngest” of the major server OEMs. The company was founded in 1984 and introduced its PowerEdge Server Line in 1994. As Dell has transformed from being primarily a consumer PC maker to an enterprise player, so too have its offerings. 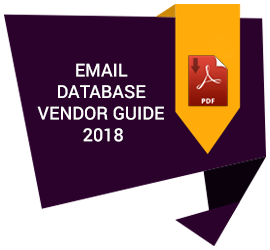 At Optin Contacts we have collated and curated the most comprehensive and accurate Dell Server Users Email List including Dell Server Users from all industry verticals. Whatever maybe your desired target audience, you are sure to find the exact title wise segmentation of Dell Server Users List at Optin Contacts. Why should you choose Optin Contacts as your data management partner for Dell Server Customers List? At Optin Contacts you become entitled to a host of advantages when you purchase the Dell Server Users Email List. Not only do you have at your fingertips the most accurate and verified list of Dell Server Users from around the world, but also get firsthand experience of the superior services and consultation of our dedicated team of data analysts. We give all persons mentioned in the list the option to be included in the list through the process of double opt-in. This way we ensure that only the persons who are included in the Dell Server Customers List are truly Dell Server Users List or are interested in receiving updates and marketing emails related to Dell Servers. Get a free sample of the Dell Server Customers List today and experience the superior quality of data provided by Optin Contacts. We guarantee you that with the help of our Dell Server Users Email List and the guidance of the team of data analysts your company’s ROI is sure to take a turn upwards. So hurry up and don’t miss the chance to help your business succeed in this highly competitive market.